"The first thing I ever watched on TV, when I was a baby, was Soul Train and the second thing I ever watched was a Cubs game." "I have a picture of me as an infant in a Cubs jersey holding onto a full sized baseball bat and it just seemed a part of my destiny, I've always loved sports." Florence Freedom All - Star OF Andrew Godbold's eyes seemed to look up through his polarized Oakley sunglasses when reliving those few, yet poignant events that started this whole baseball career thing. Andre Thornton, Andrew's cousin, who had a magnificent 14 year big league career, and his father Doctor Donald Godbold were instrumental along with other family in ensuring his upbringing stayed focused and didn't sway to the temptations of surrounding neighborhoods. Andrew Godbold believes that growing up in Oak Park, Illinois in close proximity to a professional baseball stadium aided his progression as a player. 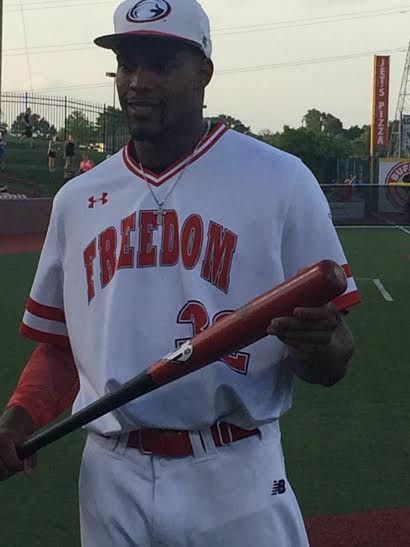 "There was always a 'season' to get ready for, it made it pretty easy for me as a kid," said Godbold, the 24-year old Florence Freedom outfielder who is representing the team in Wednesday's Frontier League All-Star Game. "It definitely was easy to stay out of trouble and keep my priorities in order." Out of high school Godbold received offers to join NCAA Division III athletics programs for both baseball and basketball. His direction changed when just one week away from reporting to a college, Kirkwood Community College in Iowa came calling, and the baseball coach told Godbold that he had what it takes to play at the next level. Godbold headed to Kirkwood, but after his freshman year, the coach that recruited him there retired and the new coach, Godbold said, did not have the same positive relationship with the young player. Godbold Returned home to Triton College in River Grove, Illinois, just outside of Chicago, rehabbed an injured leg, and was then recruited to Southeastern Louisiana which he says was, "the best thing that could've ever happened to my baseball career." "I believe everything happens for a reason, since I took this obscure route to get to where I wanted to go and had other opportunities that other people didn't and gotten seen when others didn't, I truly learned how much I wanted to do this and to go after it as far and as hard as I can." Then came the 2014 Major League Baseball draft. The Los Angeles Dodgers selected Godbold in the 23rd round where he played in the rookie Pioneer League with the Ogden Raptors in Utah. And now, at 24, he finds himself in the Frontier League with the Florence Freedom where Godbold is in his second season with the team earning his first All-Star appearance and leading the team in home runs (8) and is in the top three in batting average (.297), runs batted in (30), and stolen bases (14). When asked his plans after this season, Godbold said he wants to travel overseas to play and then come back to Florence and play next year. If, by then, he sees that his Major League dream has passed him by, he wants to continue in a baseball capacity by focusing his efforts on the front office. His second cousin, Jonathan Mariner, worked in the front office alongside Bud Selig (the former MLB commissioner). Each year's family reunion is always the time for Mariner to bring stories and encouragement to Godbold because of his belief that his cousin can do the job of a general manager at a high level. And if none of this works out, "There's always going back to school and finishing my degree." There were two goals that the Freedom outfielder had set for himself coming into the beginning of this season that apparently no one knew about: "To be able to have a goal and reach it. I wanted to be an All-Star, I wanted to be in the Home Run Derby." Fast forward to 8:24 p.m. Tuesday night at UC Health Stadium. Andrew Godbold, the second of the three Home Run Derby finalists to hit, had recorded 13 home runs in the 3-minute time frame that was allotted to each batter. Marc Flores of the Joliet Slammers had recorded 12 home runs as the first hitter and therefore was automatically out of contention. The final hitter of the evening was Steve Marino of the Southern Illinois Miners. "I think it's funny how Florence and Southern always battle great on the field and so I think it was fate that we went at it," Godbold said of his rival from Illinois.. The championship looked to be in the bag for Godbold, people even turning away with 30 seconds remaining. Why? Marino had only 7 home runs. Godbold was seen leaping up from his chair and jumping up and down with both hands buried in his face, then crouching in a catcher's position as Marino jacked number 12 with less than 3 seconds remaining over the left field wall. Then, as the clock expired and the ball just leaving the pitcher's hand, Marino hit, yes, number 13, which would've resulted in overtime. It was, however, Immediately nixed as the ball was clearly not in play as time expired, thus giving the Home Run Derby trophy bat and $250 cash to Godbold. All-Star festivities conclude Wednesday night as the 2016 Frontier League All - Star game's first pitch is at 7:05 p.m.